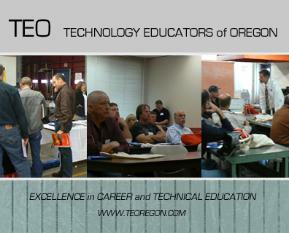 Technology Educators of Oregon, evolved from the Oregon Vocational Trade and Technical Association (OVTTA) and is serving the in-service training needs of Automotive Technology, Computer Assisted Drafting (CAD) and Metals/Manufacturing. TEO has offered content area training for instructors at the secondary, as well as post-secondary levels. Our training sessions are hosted by various high schools, community colleges and post-secondary training institutes from around the state, allowing instructors to see the best in facilities, student post-secondary opportunities and take advantage of statewide teacher in-service day in October to renew friendships, share success strategies and curriculum.